It’s not uncommon for businesses around the country to close on Sundays. For many Christian workers, this is an opportune time to take a Sabbath, a day of rest. According to the researchers, most churchgoers in the United States see Sunday as a Sabbath. A total of 77 percent said they take an intentional day of rest. The majority of these respondents take their day of rest on Sunday, while Saturday and the days immediately before and after the weekend are a day of rest for others. Specifically: 70 percent take their Sabbath on Sunday; 5 percent take it on Saturday, 1 percent take it on Friday; and 1 percent take it on Monday. In the article, Lifeway Research Executive Director Scott McConnell noted that work laws in the United States seem to simultaneously help and hinder churchgoers who wish to take a day of rest. The research also revealed that not all churchgoers these days consider taking a day of rest a part of their religious practice. A quarter of the respondents disagreed with the statement that taking a Sabbath rest every week is a biblical command that still applies today; 19 percent responded that they aren’t sure. There was also a correlation between church congregation size and the view of Sabbath as an applicable command. 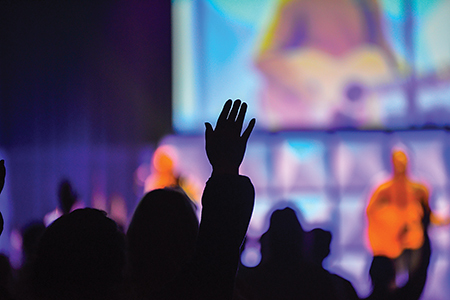 Respondents from large churches with attendance of 1,000 or more were more likely than churches with smaller attendance numbers to say that it’s a biblical command for today. Of the respondents who do observe a Sabbath, 79 percent said attending a religious service is part of it. A third said they avoid doing paid work, 30 percent said they take a nap, and 25 percent said they avoid labor or chores of any kind for their day of rest. For many people, a day of rest is the perfect time to wind down and relax with a drink. 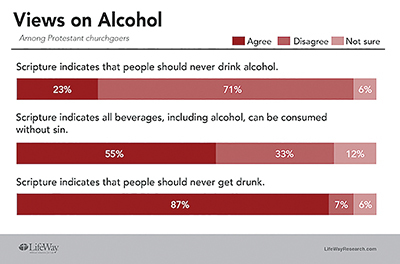 While most modern Christians agree that it’s okay to drink without getting drunk, not all churchgoers believe consuming alcohol is acceptable. In the same survey of 1,010 Christians asked about the Sabbath, the team at LifeWay Research also asked respondents about their alcohol consumption habits and beliefs. Compared to a decade ago, more Protestant churchgoers drink alcohol. However, the majority (59 percent) of the 2017 respondents said they do not drink alcohol. More than 8 in 10 churchgoers agreed that Scripture says people should never get drunk; 87 percent of respondents agreed in 2017 — compared to 82 percent in 2007. Only 23 percent of respondents said that Scripture actually indicates that people should never drink alcohol. 6 percent were unsure. In 2007, 29 percent said Scripture directs people to never drink alcohol — 6 percent more than the 2017 respondents. 60 percent of the 2017 respondents agreed that Christians drinking socially can cause other believers to stumble or be confused — 3 percent less than in 2007. More than half of Protestant churchgoers said that Scripture indicates all beverages can be consumed without sin and that Christians exercise biblical liberty when drinking reasonable amounts of alcohol. In November, Pew Research Center released a report on research examining various aspects of life in which Americans find meaning. It goes without saying that this is a broad and complex topic for researchers to attempt to collect data on in a cohesive way. For Pew Research Center’s attempt to do so, researchers used two separate surveys conducted on Pew Research Center’s American Trends Panel (ATP). The first was an open-ended question that was included in an ATP survey. It asked participants to describe in their own words what makes their lives feel meaningful, fulfilling, or satisfying. The respondents had the freedom to answer this question in whatever way came to mind. The second survey included a set of closed-ended — or, forced-choice — questions that asked participants to rate how much meaning and fulfillment they draw from each of 15 possible sources identified by the research team. 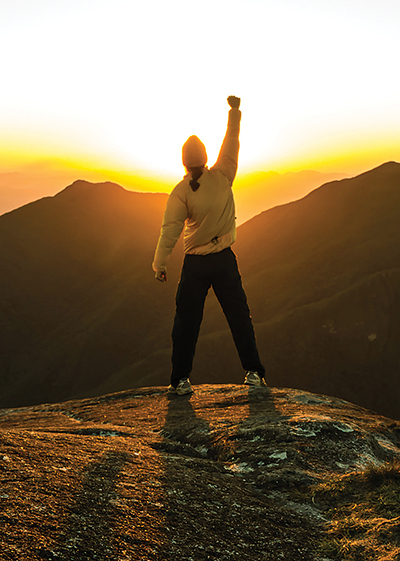 The options to rate the sources included “none at all,” “not much,” “some” or “a great deal.” The survey then asked respondents to indicate which of the ranked sources provides the most meaning and fulfillment in their lives. According to Pew Research Center, religious faith ranked lower in both surveys. In the open-ended question, 20 percent of respondents mention spirituality and religious faith when describing the things they find meaningful and fulfilling. In the closed-ended question, 36 percent of those surveyed said they get “a great deal” of meaning and fulfillment from their religious faith. However, among respondents who indicated they do find a great deal of meaning in their religious faith in the closed-ended question, more than half said it is the single most important source of meaning in their lives. Of all the respondents in the second survey, one in five Americans said religion is the most meaningful aspect of their lives. This was the second most common response, after the 40 percent who said this about family. While religion is not a universal source from which Americans said they obtain “a great deal” of meaning, it is a highly salient source of fulfillment among those who select it. Among those who said (in the closed-ended survey) that religion provides them with “a great deal” of meaning, 55 percent said that religion is their most important source of meaning. This can especially be seen among evangelical Protestants. About two-thirds (65 percent) of evangelical Protestants said they find “a great deal” of meaning in their religious faith, including 45% who said religion is the most important source of meaning in their lives. In the open-ended question, too, evangelical Protestants were more likely than other Americans to mention faith and spirituality (and Christianity, specifically) when asked what makes life meaningful. More than two in five (43 percent) of evangelicals mentioned spirituality or faith in some way, including 14% who make specific references to their Christian faith. Another notable pattern that researchers found is a correlation between conservatism and religion as a source of meaning: 38 percent of respondents who identified as “very conservative” Americans cited religion in response to the open-ended question, compared with just 8 percent of self-identified “very liberal” Americans. This is a difference that holds even when controlling for religious affiliation, according to the report. Finally, the survey results revealed that younger Americans are less likely to associate religious faith with meaning and fulfillment. Only 10 percent of respondents under 30 mentioned spirituality, faith or God when describing what affects their sense of meaning in the open-ended question. Roughly one in five adults under 30 (22 percent) reported that religion provides them with “a great deal” of meaning. By contrast, half of those ages 65 or older said that they draw “a great deal” of meaning from religion. Almost three in ten (29 percent) of respondents ages 65 or older said religion is the top source of meaning in their lives, while just 10 percent of respondents under 30 said the same. For more information about religious faith and other aspects of life that Americans find meaningful and fulfilling, see the research at the Pew Research Center’s website.